Split and scrape vanilla bean. Wash, dry, halve, and remove the stones from the apricots. Finely chop the pistachios. For the vanilla sauce, place the cream, milk, and vanilla bean seeds and pod in a saucepan and boil briefly. Mix egg yolks and sugar in a bowl until lighter in color and fluffy. Add a few tbsp. of milk mixture to the egg yolks and mix to temper. Then pour the egg mixture slowly back into the pot and simmer with constant stirring until the vanilla sauce is thickened. Remove vanilla bean pod, transfer immediately to a serving vessel, and set aside. Mix all the ingredients for the dough and knead until the dough does not stick together. Dust with flour as needed. Divide the dough into 8 portions and roll into balls. Push the balls flat and place an apricot half in the center. Close dough around the fruit close and roll again to balls. In a large saucepan, bring water to a boil. Cook the apricot dumplings for approx. 10 min. until they bob to the surface. Remove from the pot with a slotted spoon and allow to drain well. For the breadcrumbs, heat the butter in a frying pan until it becomes frothy. Add the breadcrumbs, sugar, and chopped pistachios and stir until golden brown. 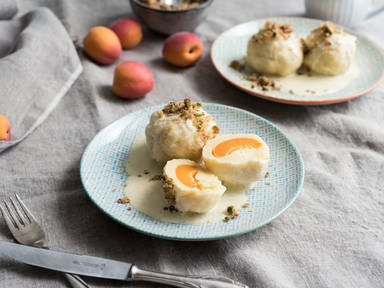 Serve the apricot dumpling with vanilla sauce and bread crumbs. Enjoy!